Q.What is more enjoyable than having lunch with family and friends on a Sunday? A. 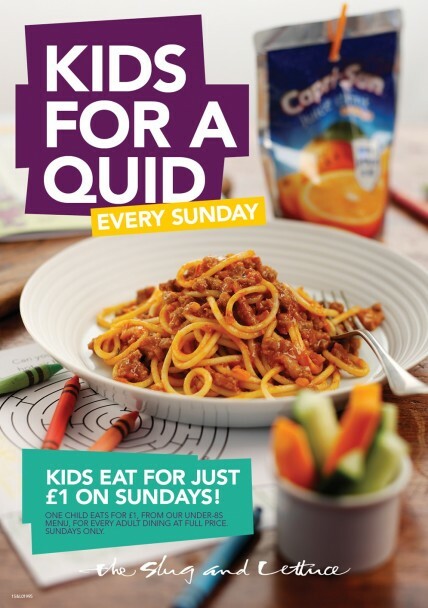 Enjoying lunch with family and friends, where the kids eat for only £1! We have just discovered this fantastic promotion from The Slug and Lettuce, where the kids can enjoy food and a drink from the Under 8’s menu for £1 with a full paying adult. There are tons of restaurants to choose from dotted around the country. Although sadly some of the London Slugs are closed on Sundays including Artillery Row,Fetter Lane, Stoney Lane and St Mary Axe. Have a fantastic Sunday and Enjoy!